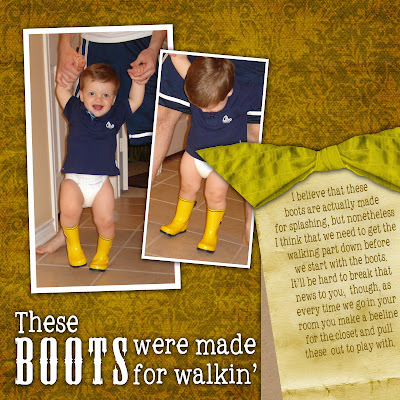 Luke is obsessed with these yellow rain boots :) He's constantly pulling them out of the closet and holding them up to his feet and he LOVES to wear them (he's also started putting buckets on his head and walking around like that - I'll post pictures later). I loved to play dress-up when I was little and could spend hours playing pretend and so I've already started a dress-up box for Luke and have a folder of sewing patterns for the future as well (capes, dinosaur spikes, policeman vests, etc.) I really want to encourage him to role play and have a great imagination and I think that dress-up could be a great way for him to develop that. so cute!!! I love the little yellow rain boots!